We're thrilled and proud and a little bit scared to announce our newest LibraryCamp 2014 sponsor - Dawn of the Unread! 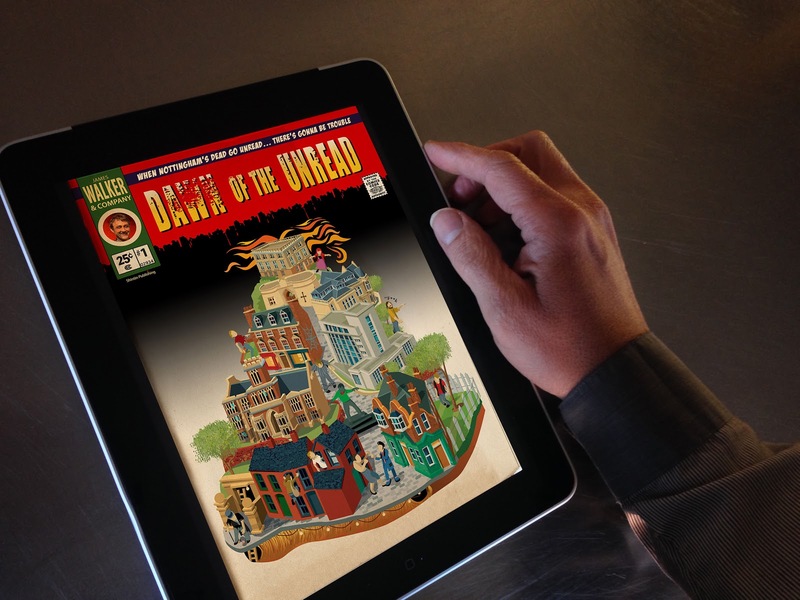 Dawn of the Unread is an interactive graphic novel that is available across all media platforms (iPad, Android, iPhone, website). It aims to raise awareness of local literary history and in turn a sense of civic pride. Whether we like it or not, the nature of reading is/has changed and so we are looking at different ways to make the written word more accessible and explore the relationship between digital and print media. We like to think of this as an ‘open relationship’ rather than a happy marriage. The narrative is a loose twist on the zombie genre: ‘When the dead go unread there’s gonna be trouble. Writers from Nottingham’s past return from the grave in search of the one thing that can keep their memories alive: boooks’. On the 8th of each month a new comic is released and is created by different artists and writers. These include: Alison Moore, Eddie Campbell, Hunt Emerson and Nicola Monaghan. Each writer explores one iconic figure from Nottingham’s literary past that includes: The 5th Duke of Portland, Slavomir Rawicz, the fictional hybrid Byron Clough, Alma Reville (Mrs Hitchcock) Alan Sillitoe, D.H Lawrence and many more. This is literature in its most diverse sense, exploring medieval ballads, black-letter verses, poetry, philosophy, literature, and reportage. Each comic in the serial has libraries, archives or bookshops at the heart of the narrative. This is because we believe that physical books still have an integral role to play in education and democracy. Our target audience is reluctant readers – better known as the ‘youtube generation’ - although the embedded content enables readers to go deeper into the text and address different nuances of learning. At this point, astute readers will be wondering: what on earth has a digital graphic novel got to do with physical books and libraries? The next paragraph is for you. Dawn of the Unread has a unique gaming function in that users have to perform four tasks at the end of each chapter. Scores are recorded on a virtual library card. The person who scores the highest features as a character in the last chapter. The tasks are: GO – visit a location. This is recorded via GPS. BWAINZ - answer multiple choice questions. READ – get a relevant book out from the library. CREATE – upload a story inspired by the chapter and view it on one of four screens (two in London, two in Nottingham). 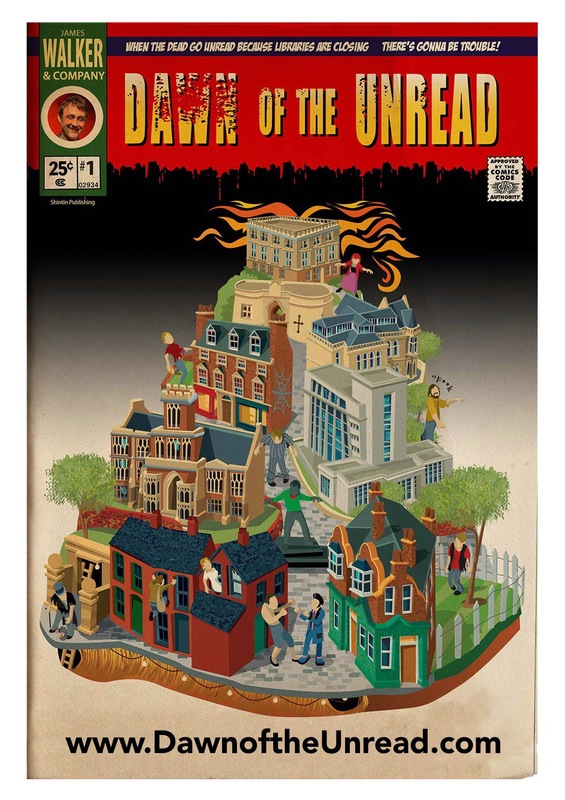 Dawn of the Unread is an attempt to address worrying illiteracy figures that have recently seen the UK ranked as 22nd out of 24 industrialised nations for illiteracy. Our goal is to see whether a more rounded and interactive approach to reading can help improve literacy as well as drive readers to libraries. If successful it could be adapted regionally. We are writing to every school in Nottinghamshire to try and get as many 14+ readers involved and excited about books. And this is why we have decided to sponsor Library Camp because, like us, they recognise the importance of books having a visual presence in our lives and libraries as being the best place to engage readers. So please join our digital and artistic editor Paul Fillingham on the 13 September and help us celebrate wordy goodness. And please help us spread the word. You don’t have to be from Nottingham to learn about our rebellious history. This sounds fantastic idea. I work for Explore Libraries and Archives in York working on community arts, culture and digital media development and welcome the opportunity to have a chat with you. I should be going to library camp so hopefully see you there.